In other news: how will our celebrity matches conclude? I gave Penn Jillette my highest rating of the week, so I was disappointed to see him so slow out of the gate. Thanks in large part to a quick correction on his Daily Double, he’s got a crush heading into Final, and Cynthia’s out of it. As with most of this week, this is a straightforward situation. If Zachary doubles his score, he’ll have 22,800. 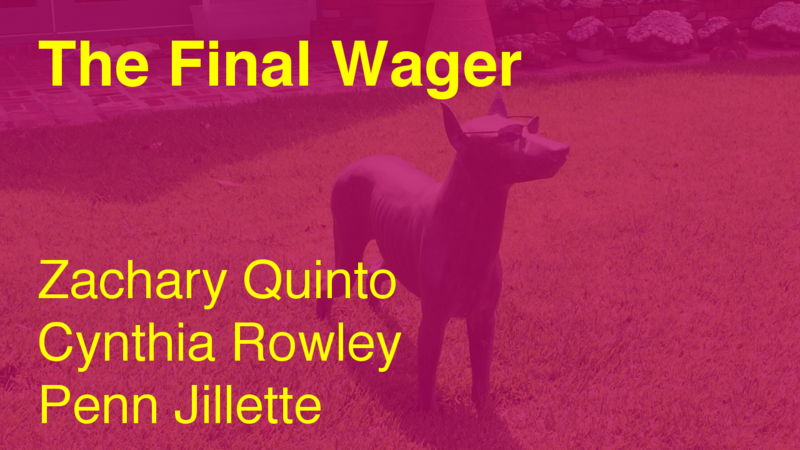 To cover this all-in wager, Penn will need to wager 4,000. An incorrect response with that wager will leave Penn with 14,800. To get above his total, Zachary must wager at least 3,400. And that’s it. Cynthia can’t catch Penn but might as well wager everything to nab that extra $600 over the minimum if she’s right. And another triple stumper to wrap up this edition of Celebrity Jeopardy!. Oh well – this week had its moments, I guess.